Aveline—heroine of Assassin's Creed Liberation for the PlayStation Vita—isn't that different from the other characters of Ubisoft's historical action series . Like Altair and Ezio, she's an Assassin, a near-mystical stealth warrior with abilities that let her be unseen whenever she wants. But one thing about her stands out compared to those two. The Bad Guys Are Making Assassin&apos;s Creed III: Liberation. I&apos;m Suddenly Much More Interested. 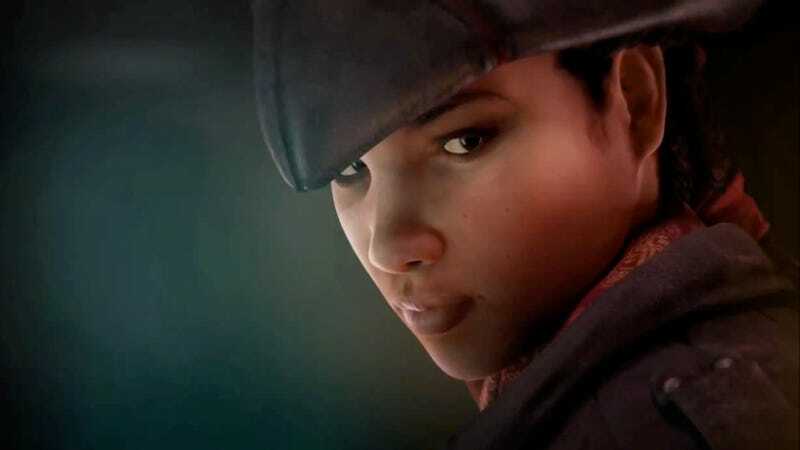 The idea of Aveline intrigues me because she's a black woman, one who happens in the leading role of a major video game. During previews of two upcoming Assassin's Creed games last week, I saw glimpses of black people in Ubisoft Montreal's fictional vision of the American past. When you take the grand sweep of American history into account, it's only relative recently that people of African descent could walk where they pleased. Slavery and the Jim Crow laws that followed made it so that entire zones of society were off-limits to black people. What you have, then, in Aveline is a character that would stand out in the extreme in 1786. But I like that. I'm glad Ubisoft are putting black people in their made-up past. Race, gender and historical circumstances aside, Aveline isn't any more preposterous than Altair or Ezio. Signor Auditore came from money, became a member of a secret society, rubbed elbows with Da Vinci and invaded the Vatican. Things like that weren't exactly everyday occurrences in Renaissance Italy. The Assassin's Creed games have always been interested in the intersections of peoples from centuries past. You got the sense that rich and poor, foreign and native were all walking down the streets of Jerusalem in Assassin's Creed 1 and in the various Italian cities in the three games featuring Ezio Auditore. Travelers from far-off lands can be quest-givers, sending you to exotic locales in search of forbidden knowledge. These are games that have felt cosmopolitan and the setting of colonial America gives them new populations to explore. The North American continent was a new world compared to the centuries-old histories of France, Germany and other European countries. Part of that newness came in the form of African slaves and the customs they brought with them. If the subtext to Assassin's Creed franchise is that amazing things happen when cultures combine, then Aveline's very existence is in line with that theme. According to the Ubisoft Montreal developer showing Liberation, the game's bi-racial heroine has a father who was a French merchant and a mother who was a freed slave. When I asked whether Aveline's father had owned her mother, the developer demurred at answering the question. He made it seems like he might be giving away a plot point if he told me what I wanted to know. I had two reactions to that. The first was to respect the sanctity of whatever mandates he might be working under, with regards to revealing details about the game. The second was more complicated. In a game set in an era where chattel slavery was still happening, such a thing would be commonplace. You need look no further than Thomas Jefferson's relationship with Sally Hemmings for a model of such a dynamic. Could you really get across the complexities of interracial relationships in a portable video game, though? I also wondered if Aveline's wanton killing of her mostly male enemies could be explained away by her role-playing as a man. Her breeches and tricorner outfit could certainly imply that. Nope was the answer to that question. In fact, she's also going to be walking New Orleans in ladies' fashion of the time, seen in the screen captures above. After I'd asked these questions, I sat with my thoughts for a while and remembered that what it meant to be a black person in 1786 was radically different than what it means to be one now. It's easy to project my previously documented desires onto Aveline and the other black characters that might show up in Liberation. That's because characters like Aveline are diamond-rare in video games. No matter how the finished Assassin's Creed Liberation turns out, she's already valuable.